Winter weather has closed several highways in our state in the past few days -- including I-90 and Snoqualmie Pass. Crews are working hard around the clock to clear the roads, but also must do so safely. We thank everyone for their patience as we continue this work. Here are the closures in our state. This list will be updated and those updates will be labeled "UPDATE" with a time and date. When a road reopens or situation is cleared, that will be indicated with "REOPENED," “DONE” or "CLEARED." I-90 UPDATE Jan. 19 4 p.m.: Eastbound lanes are open. Westbound lanes expected to open by 6 p.m. Thursday. CLEARED US 2 Jan. 19, 3:35 pm. : The highway is closed from Coles Corner (milepost 85) to Leavenworth (MP 99) due to multiple snow slides. Conditions on I-90 have improved enough to allow our maintenance crews to start clean-up efforts on Snoqualmie Pass and the highway. This includes clearing dozens of trees that fell onto eastbound lanes as well as clearing ice, snow and other debris. We are hoping to get the eastbound lanes open Thursday afternoon and that time we'll evaluate the westbound lanes to determine if we can reopen them later this evening. Excavators and loaders will be used to break up and push the 20 to 30 downed trees in the eastbound lanes. 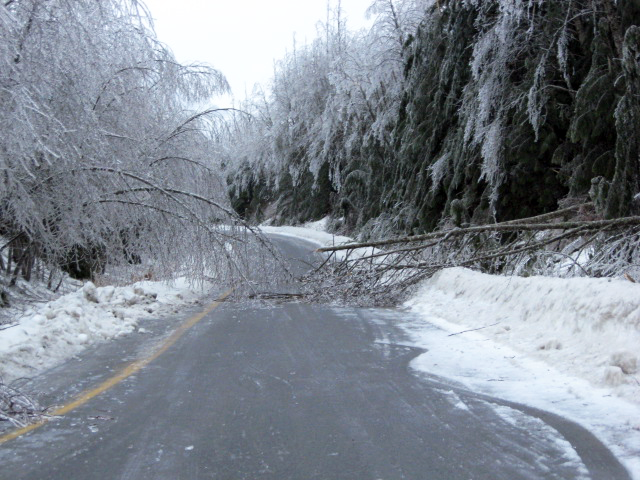 We will also need to take down about 20 to 30 trees in the westbound lanes that have heavy ice build-up. 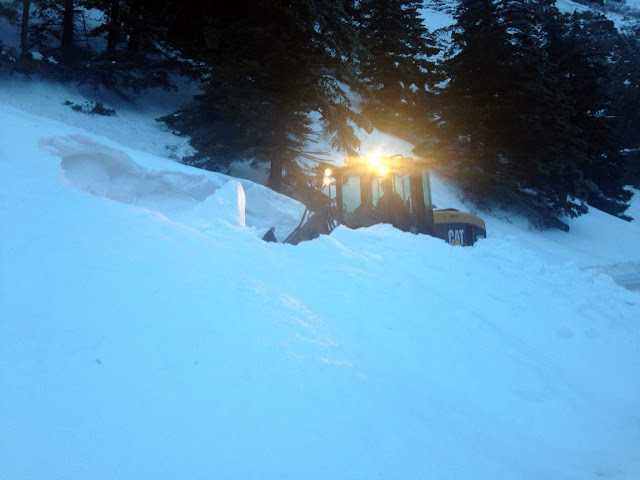 We also did avalanche control west of the summit this morning to remove unstable snow. Significantly hazardous road conditions have both directions of I-90 closed between North Bend and Ellensburg at least through Thursday morning. State Route 14 in the Gorge also was closed most of the day while crews assess hazardous conditions there, but it reopened as of 4 p.m. Wednesday. Ice buildup brought down dozens of trees on I-90 between North Bend and Ellensburg. 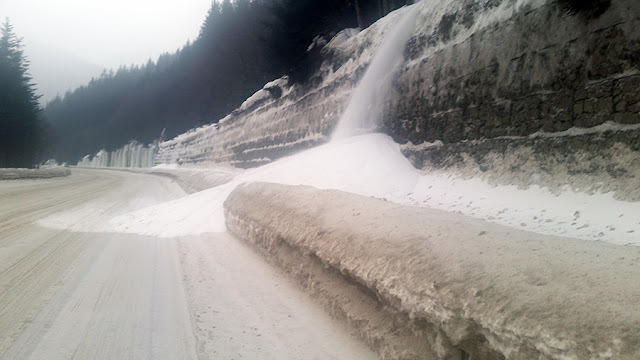 The highway initially closed Tuesday night, Jan. 18 as heavy ice accumulation led to dozens of trees falling and leading to unstable slope conditions along the highway. Conditions were so hazardous that our crews were not able to operate along the highway to attempt to clear snow, ice and debris. Our crews reevaluated the situation at first light on Wednesday but found that it was still too dangerous to allow our workers and the traveling public to go through. So we will reevaluate the conditions again on Thursday morning. Until I-90 reopens, drivers can use alternate routes such as US 12 over White Pass, US 2 over Stevens Pass and US 97 over Blewett Pass but they should be prepared for winter conditions and check our pass reports before heading out. While opening up the roadway is a goal, safety is always our top priority, both for our workers and the public, and until we are confident that the roadway is safe, we will keep it closed. The conditions we're seeing on Snoqualmie Pass are similar to what we saw a few years ago on US 2 which resulted in some fatalities so we are taking every precaution we can to keep everyone safe. The weather forecast calls for more freezing rain and snow through Thursday morning so it's impossible to guess when conditions will clear up enough to reopen. close I-90 between North Bend and Ellensburg Tuesday night. Heavy snow, downed trees and hazardous road conditions kept SR 14, in the Columbia River Gorge between Washougal and the Hood River Bridge, closed most of the day. Crews worked through the night Tuesday and during the day Wednesday to reopen the highway. Weather conditions mean freight traffic is still restricted from this highway. Gorge which was hit with heavy snow and downed trees. We will update you here about closures and re-openings. US 101 along Lake Crescent (milepost 228.5) closed earlier today due to a downed boulder. Highway along the Columbia Gorge was closed Wednesday. We know having highways closed is frustrating but safety will always be our top priority and we appreciate your understanding and patience as we make sure our crews are safe while we work to reopen these roadways. 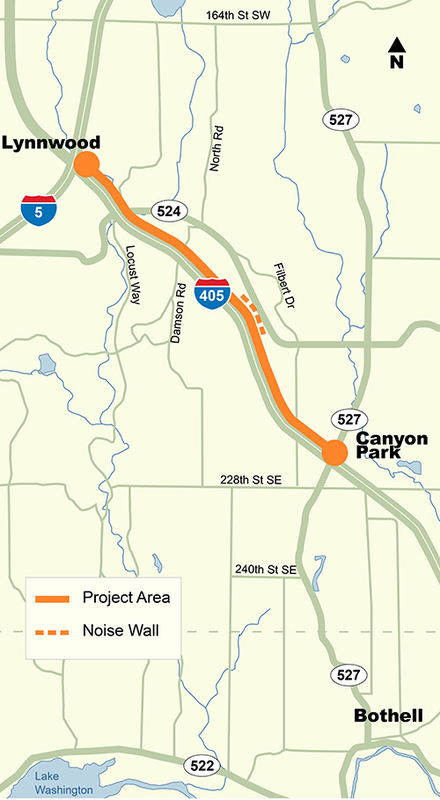 Heads up, northbound Interstate 405 travelers: In Snohomish County, work has begun on a new peak-use shoulder lane in the congested 1.8-mile stretch between State Route 527 and I-5 in Lynnwood. Construction is starting ahead of our original schedule, and the lane is on track to open to traffic this spring. Overhead signs will tell drivers when the shoulder is open to traffic. What’s a peak-use shoulder lane? As the name suggests, drivers and buses will soon be able to use the northbound right shoulder as an additional general-purpose lane during times with the heaviest congestion—in this case, the weekday afternoon commute. How will lane construction affect my commute? At first, crews will close only shoulders to complete their work. As the project progresses throughout the next few months, there will also be some nighttime lane closures. 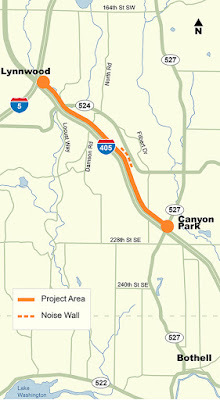 Be sure to keep an eye on the I-405 construction closures website to get detailed information about closures as they approach. from SR 527 to I-5. How will I know when I can use the new lane? 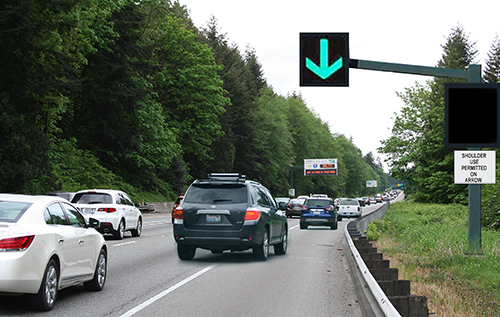 Once this project is complete, new overhead signs will alert drivers when the lane is open with a green arrow and closed with a red “X”, similar to the signs you see today on I-5 near Seattle. As with all highway operations, our traffic management center will be actively monitoring the lane. If there is a collision or incident, we will be able to close the lane in order to allow emergency services to respond. There will also be four emergency pullouts in the area of the peak-use shoulder lane. This is the first dynamically controlled peak-use shoulder lane in the state, as well as the first example of I-405 express toll lane revenue being reinvested in the corridor. We recognize that introducing a peak-use shoulder lane between SR 527 and I-5 is one step toward improving congestion in this area. That’s why we’re also looking at more comprehensive, longer-term improvements such as adding new lanes in each direction and rebuilding key interchanges. For now, we’re looking forward to providing new capacity for north end drivers —and on an accelerated schedule. Stay tuned for a comprehensive look at how to use the peak-use shoulder lane and how we will work with our emergency service partners to operate the lane in the coming months. As I began my on-call communications shift over the New Year’s holiday weekend, I figured it would be busy. With sub-freezing temperatures and snow in the forecast, I predicted an eventful start to 2017. Unfortunately, I was right. On Monday, Jan. 2, I received a call I still can’t stop thinking about. 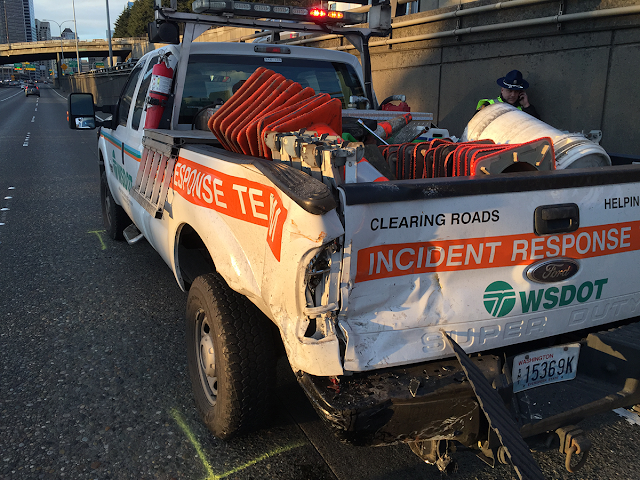 Craig, one of our Incident Response Team drivers was hit at freeway speed on northbound I-5 in Seattle by an RV. What was more shocking – and a huge relief – was that Craig was not seriously hurt. when struck on the side of I-5 in Seattle while helping a disabled vehicle. Craig was responding to a disabled Subaru just south of Seneca Street. He parked on the right shoulder and before getting out of his rig, checked the rear view mirror and saw the RV barreling toward him. He tried to get out of the way, which likely lessened the impact. Thankfully, he was buckled in when the RV struck. The good news is Craig walked away with minor injuries. 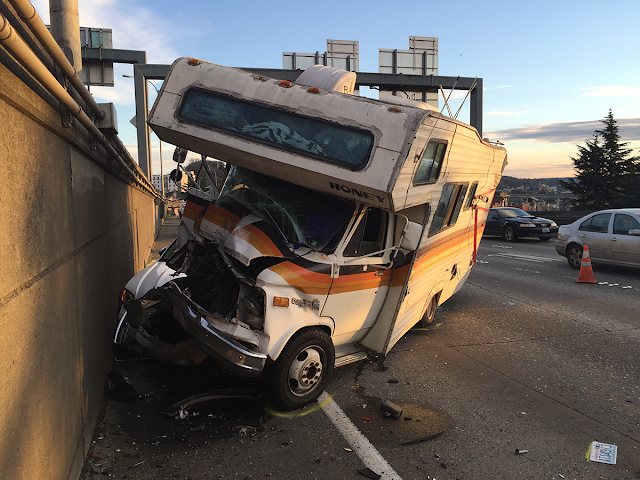 The Washington State Patrol arrested the driver of the RV on suspicion of DUI. The driver of this vehicle – which struck our IRT truck on the side of I-5 in Seattle – was later arrested on suspicion of DUI. While we’re glad Craig made it out of the incident OK, this brings up a bigger message that we’ll continue to make: Our road workers, including our IRT and maintenance group, have families waiting for them to come home and need your help to keep them safe. This is the second time in less than two months one of our IRT vehicles has been hit, not to mention the near-misses they experience regularly. Please, slow down around our work crews and give them space to work. Focus on the road and make smart decisions behind the wheel. Never operate a vehicle when you’re intoxicated. Our crews work hard to clear incidents, remove debris from the roadway and so much more. It’s a dangerous job and we are lucky to have our fleet of superheroes (59 to be exact) positioned across the state to keep you safe and traffic moving. Please help us send them home safely every day by being safe and smart on the roadways. UPDATE: Wednesday, Jan. 25: Thank you to all the grades 6-8 artists who submitted drawings to our contest! We received over 150 submissions and it was tough to choose just one winner! 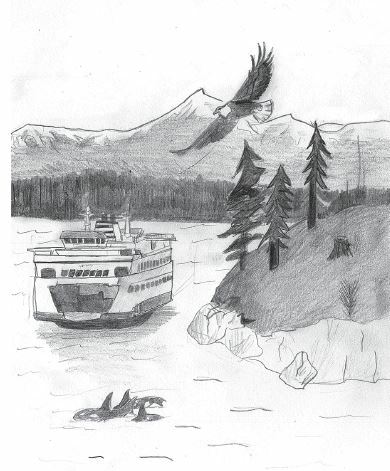 The winning drawing is by 13-year-old Alexander Sowers of Seattle and shows off Puget Sound flora and fauna. Alexander’s drawing will be featured on the cover of the 2017 spring sailing schedule. It’s cold, windy, and in some cases snowy outside, a typical Pacific Northwest winter, but this ought to put a spring in your step! We’re looking for a fresh new look for our spring 2017 sailing schedule. Middle schoolers, put your thinking caps on, because we’re inviting you to participate in our spring cover contest. Students in grades six through eight have until mid-January to create and submit an original drawing based on the theme “Ferries + Puget Sound Wildlife.” It may be cold outside, but think of all that there is to look forward to in April…sunshine, plants in bloom, and wildlife! This spring we’ll print over 600,000 ferry schedules with the selected cover art and distribute them across our 10 ferry terminals and 22 vessels that make up Washington State Ferries. That schedule cover art could be yours! winter sailing schedule, out now. All students in middle school (6-8) are eligible and invited to participate in this contest. Submissions will be accepted beginning on Tuesday, Jan. 3. The contest ends Wednesday, Jan. 18. No submissions will be accepted after this time. Media: Submissions must be hand-drawn (no electronic illustrations, please) in black and white. Color submissions will not be accepted. Any of the following media may be used: paint (watercolor, tempera, poster, acrylic, etc.) and drawing materials (pencil, charcoal, chalk, pastels, markers, crayons, etc.). Artists are encouraged to use bold, strong lines. Original artwork: All work must include a ferry or elements of a ferry (i.e. life ring). No copyright images, text or other material will be accepted. (For example, artwork depicting characters from television shows, video games or books is not allowed). Deadline: All submissions must be received by Survey Monkey or mail by Wednesday, Jan. 18. How do students submit their drawings? Electronic: Submissions must be entered via Survey Monkey. Please fill out the form with contact information and upload the drawing by Wednesday, Jan. 18. Please note: Each student may only submit one drawing. Who will select the winning drawing? A panel of judges from the WSF executive team will review entries. 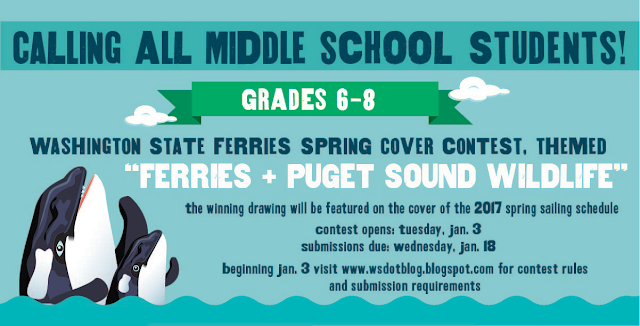 A winner will be selected whose work best depicts the theme of “Ferries + Puget Sound Wildlife.” Entries will be judged on creativity, originality, clarity of theme and artistic merit. Five finalists will be selected and featured on the WSF website, on the WSF Twitter, and in the WSF weekly update. From those finalists, a winning drawing will be chosen to be featured on the 2017 WSF spring sailing schedule.